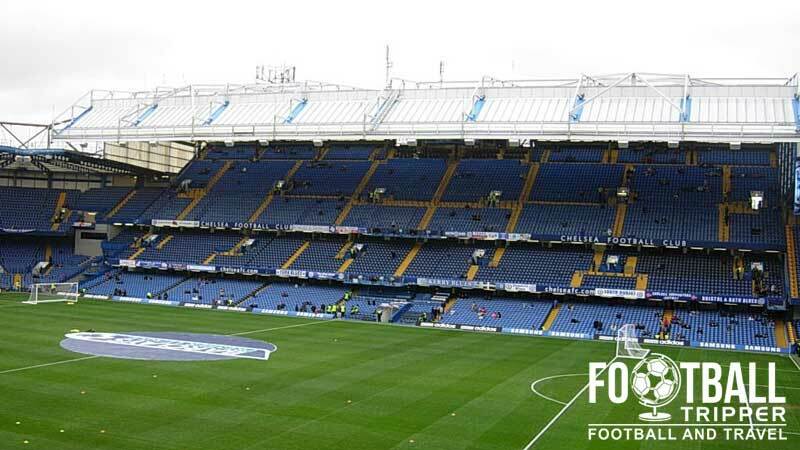 Stamford Bridge is the home of nouveau riche football club, Chelsea. 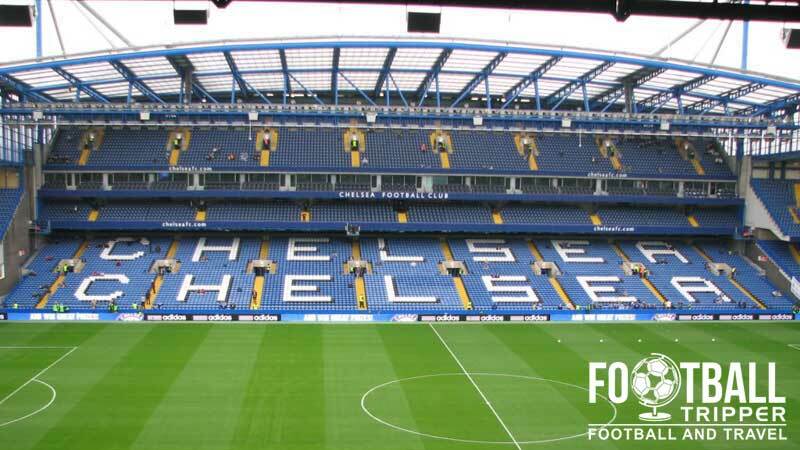 Located in West London with a capacity of 41,837 the ground has been used for a number of high profile sporting events such as FA Cup finals, Charity shield and Rugby Union and even American Football. Stamford Bridge first opened in 1877 and originally hosted the sporting events of London Athletic Club who remain active and based in West London to this day. The plot of land was purchased by Gus Mears in 1896, and after failing to persuade Fulham FC to locate to the stadium, he eventually set out to establish his own football club, and thus Chelsea were formed in 1905. Aiming to compete with other London based clubs, Mears hired the famous architect Archibald Leitch to design the Stamford Bridge after he successfully constructed Celtic Park and Ibrox in Scotland. The first iteration of The Bridge had an official capacity of 100,000 making it the second largest ground in England behind Crystal Palace. Retaining the original athletics track, views of the pitch weren’t great and the terraces consisting mostly of steeped banks created by excavated debris. In 1945 Chelsea took on FC Dynamo Moscow in a friendly to ease the political tensions between the United Kingdom and Soviet Union after the Second World War. In the 1970s Chelsea formulated plans to modernise Stamford Bridge, however the construction of the East Stand plunged the club into debt, and ultimately resulted in the separation of the freehold and the club. 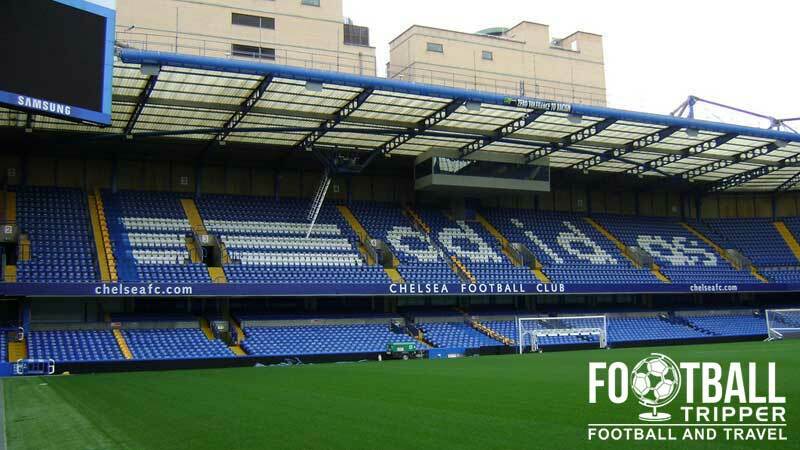 After the publication of the Taylor Report, Hammersmith and Fulham council granted planning permission for Chelsea to rebuild Stamford Bridge as a 34,000 capacity ground with the problematic athletics track was finally eliminated. 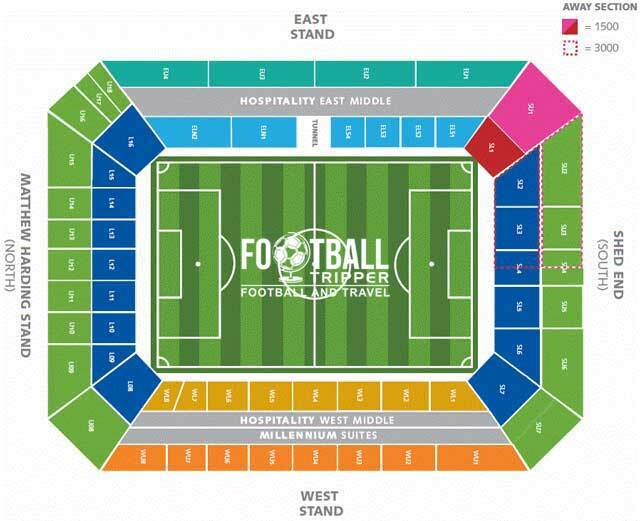 The following four sections constitute Stamford Bridge: the Matthew Harding Stand (North), the East Stand, the Shed End (South) and the West Stand. 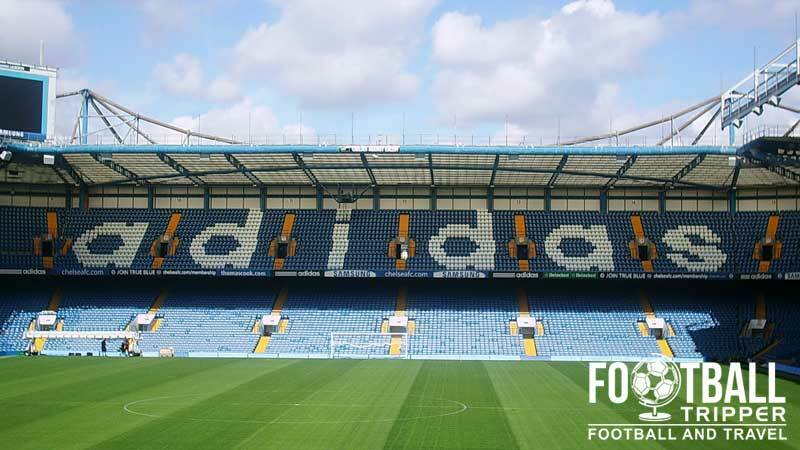 Visiting supporters to Stamford Bridge are housed within one side of the famous Shed End with the standard allocation of around 3,000 tickets usually taking up the sections of the lower-tier. For cup games where the club are required to be more generous, the entirety of the shed end’s central column is given to the travelling fans. Within the first-tier of seating within the shed-end the views aren’t the best in the stadium as the position of the seats is slightly too low to get an overall view of the game, with the relatively steep incline between each row of chairs seemingly doing very little to help. The concourse itself is spacious enough with a reasonable number of televisions to keep fans occupied before kick-off and at half time, and the number of toilets are adequate enough albeit busy as per every other ground. Stamford Bridge supposedly has the largest number pubs within a mile radius of any English ground, although The establishments on Fulham Road such as the Fox & Pheasant are self-described “Chelsea pubs”, and only permit the home faithful to enter. For away fans it might be more advisable to stop for drinks en-route to the ground. 2-3 minutes away on on the District (Green line), Earl’s Court is a popular choice with some fans. Right outside the station is Courtfield and The Blackbird Pubs which both specialise in real-ales. Alternatively you could stop in at any of the watering holes housed within the main train station you enter London from. Places such as Paddington, Victoria and St Pancras all have chains such as Wetherpoons within the immediate vicinity. Along both Fulham and North End Road there are numerous fast food establishments such as KFC, McDonalds and Greggs which attract football fans in their droves on matchday. Food vans around the ground are also predictably popular, with the stalls selling similar stuff such as sausage rolls, pies and burgers as inside the ground. The aptly named Stamford Bridge mega-store is open 7 days a week for visitors, and is easily the best place to purchase merchandise not withstanding the official online store. On matchdays the megastore is open until kick-off, closed during the match and reopen at fulltime for a little while afterwards. Chelsea offer fans the chance to explore Stamford Bridge and get up close and personal with the clubs burgeoning trophy room housed in the Museum. Tours run Monday to Sunday, and depart every 30 minutes between 10.00 am to 3.00 pm, with visits to the museum slightly more flexible. Entry is normally permitted between 9.30 am – 5.00 pm, and can be purchased as part of the tour. Tickets start at £13.00 for children aged between 5-15 years, and up to £20.00 for 16+, with concessions available for students and senior citizens. Sometimes it can be worth checking out verified resellers who often list unwanted season tickets on a game by game basis for slightly discounted prices. Situated in the London borough of Hammersmith and Fulham Stamford Bridge is one of the most centrally located grounds in the city. The easiest way of getting to the ground is of course the London Underground aka The Tube. The Chelsea FC sign marking the entrance to Stamford Bridge. Of course it wouldn’t be London without a red bus in the background. There aren’t any public car parks at the stadium, it is strongly advised that you use public transport instead. London has numerous train stations which serve various parts of the United Kingdom including: London Euston (Midlands and North), London Liverpool Street (East and West Anglia), London Victoria (Southeast) and London Paddington (West). As you’re in London, chances are you’ll be travelling on the tube. In which case you’ll want to get on the District Line (The Green one), and look out for Fulham Broadway, which is the nearest station. An alternative option for those coming from South London, is the overground line departing from Clapham station, stopping off at Imperial Wharf Station (15 minute walk away) or West Brompton which is slightly closer. One of the many signs which you will encounter upon leaving the Fulham Broadway Tube Station. In case of delays, strikers or cancellations there are two bus stops right outside the Fulham Road side of stadium with the number 14, 211 and 414 buses providing good service. As the capital of England, the city of London is well connected to the rest of the world, with both Heathrow and Gatwick International Airports less than 30 miles away via a reliable overground train service. For budget flights there is also the likes of Stansted and Luton which are slightly further away, but definitely worth the potential savings. London has a wealth of hotels and accommodation options to suit all budgets, but on average you’re going to pay quite a bit more than anywhere else in the UK. This is even more the case in the area where Stamford Bridge is located as Chelsea is a very affluent area of the city.